This park provides safe anchorage, swimming, snorkeling, kayaking and fishing. One mile south of the park are the scenic Freil Lake Falls, which tumble down into Hothman Sound from Freil Lake. This park is very popular with boaters and may be congested during long weekends and the summer months. There are no facilities at this park. The park is situated on the east side of Hotham Island, north of Granville Bay and consists of the southernmost island. The other islands are privately owned and are not a part of the park. Please respect these areas and do not trespass on private property. 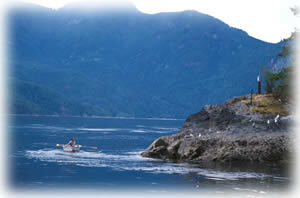 The park is situated on the east side of Hotham Island, north of Granville Bay and consists of the southernmost island. The other islands are privately owned and are not a part of the park. Please respect these areas and do not trespass on private property. The closest community is Powell River. Approved Purpose Statement and Zoning Plan [PDF] for Harmony Islands Marine Provincial Park is available online in pdf format. There are opportunities for canoeing and kayaking in this park. There is no canoe or kayak camping available. There are tidal water fishing opportunities available. Anyone fishing or angling in British Columbia must have an appropriate licence. Rockfish Conservation Areas occur within this park. Fishing activities are limited in Rockfish Conservation Areas. Before you go fishing please refer to the Rockfish Conservation Area descriptions available from Fisheries and Oceans Canada DFO. There are SCUBA diving and snorkelling opportunities for self-equipped parties. There are no SCUBA rentals available in the park. There are swimming opportunities at this park. It is ocean swimming with mostly rocky beaches. There are no lifeguards on duty at provincial parks.